Sympathetic preganglionic neurons are found particularly within the intermediolateral nucleus in the lateral horn of the thoracolumbar spinal cord (T1- L4). Parasympathetic preganglionic neurons are located in the sacral spinal cord (intermediate gray matter) and in the brainstem (parasympathetic nuclei of oculomotor, facial, glossopharyngeal and vagus nerves, plus cardiac preganglionic neurons are located in nucleus ambiguus). Cell bodies of General Visceral Afferent (GVA) primary afferent neurons reside in spinal ganglia and in the distal ganglia (petrosal & nodose) of glossopharyngeal and vagus cranial nerves. Spinal afferents convey noxious and temperature sensations; cranial nerve afferent traffic is largely subconscious. Visceral receptors are generally free nerve endings (although Pacinian corpuscles are present in viscera). Only about 10 percent of total afferent input to the CNS is visceral (GVA); compared to somatic (GSA) sense, visceral sensation is meager. Central branches of GVA primary afferent neurons synapse within sensory nuclei in the spinal cord & brainstem. Sensory nuclei contain interneurons (for visceral reflexes) and projection neurons (for conscious and subconscious ascending pathways). Conscious visceral sensations include levels of fullness and pain, the latter is typically referred pain because visceral and somatic afferent neurons generally share projection neurons. The insular cortex (deep to sylvian fissure) is a visceral sensory area of the neocortex that receives input from the thalamus (ventral posterior nuclei). The medial frontal cortex (rostroventral cingulate gyrus) is a visceral motor area of neocortex. The amygdala, a limbic basal nucleus of the rhinencephalon, is involved in generating visceral activity, particularly fearful emotional behavior. It receives sensory input from thalamus and association cortex per sensory modality. Autonomic input arrives from insular cortex, hypothalamus and parabrachial nuclei. Memory related input comes from the hippocampus and adjacent neocortex. Projections from the amydala are widespread to cerebral cortex, hypothalamus, PAG, parabrachial nuclei and the NST. The hypothalamus is the major homeostatic control & circadian rhythm center of the brain. It regulates endocrine activity via the pituitary gland; it controls energy metabolism, body temperature, blood flow & blood composition; and it drives behavior related to feeding, mating and emotional responses. 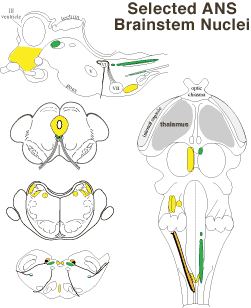 In general, the rostral hypothalamus drives parasympathetic activity and the caudal hypothalamus drives sympathetic activity. In particular, the hypothalamic paraventricular nucleus projects to sympathetic and parasympathetic preganglionic neurons and to brainstem autonomic centers (PAG, RVLM, solitary tract nucleus). The pontine micturition center (PMC) is located dorsally in the pons. It gives rise to axons that descend to the lumbosacral spinal cord where they excite preganglionic neurons to detrusor smooth muscle and inhibit neurons to urinary sphincters. The PMC also controls the urinary tract indirectly via input to medullary recticular nuclei that dispatch axons to the lumbosacral spinal cord. The PMC receives input from the hypothalamus, PAG, and spinal cord. Medial and lateral parabrachial nuclei border rostral cerebellar peduncle fibers in the pons. The nuclei relay visceral information from the solitary tract nucleus & spinal cord to the hypothalamus, contralateral thalamus, and limbic system. Vestibular input to parabrachial nuclei is significant in connection with motion sickness. Neurons of the medial parabrachial nucleus mediate baroreflex constriction of coronary vessels. The rostral ventrolateral medulla (RVLM) controls blood pressure by regulating vasoconstriction and cardiac output. It receives input from peripheral baroreceptors & chemoreceptors and several brain sites, including the PAG and hypothalamus. Its axons descend to sympathetic preganglionic neurons in the spinal cord to regulate muscle and visceral vasocontriction. Some RVLM neurons are tonically active. The area postrema (AP), which is a circumventricular organ (lacking a blood-brain barrier), is located dorsally at the caudal end of the medulla oblongata. The AP has chemoreceptors known to detect emetic agents in blood. AP along with NST neurons project to sites in the caudal medulla responsible for executing coordinated somatic and visceral components of emesis.